Mendon resident Ellen Smith was awarded the “American Spirit Award” by the Reserve Officers Association at a dinner Friday night at the Rochester Yacht Club for her work in resettling Afghan and Iraqi interpreters and support personnel who worked for the U.S. military. She was recognized for her work, along with Medal of Honor recipient, and Greece resident, Gary Beikirch, for his service to his community. They were presented with the awards by Dennis Lutz, Major General (Ret.) U.S. Army. 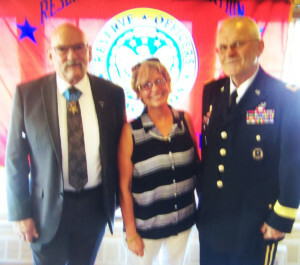 “It was an honor to be recognized by the ROA, and to stand side-by-side with Gary, a member of the Green Beret Special Forces, who risked his life to save U.S. soldiers and Montagnard villagers when he was in Vietnam,” Smith said. The ROA presented Smith with the American Spirit Award for starting the Rochester Chapter of No One Left Behind. She runs the chapter out of her farm in Mendon, where she collects donations to furnish apartments for newly-arriving refugees who served the military, and arrive under the government’s “Special Immigrant Visa” (SIV) program. NOLB pays the first month’s rent and a security deposit for housing, pays for a family’s initial food, and once a refugee has 50 volunteer hours with the organization, Smith will find a modest car for the family. When there is a lack of affordable housing, Smith and her family have housed these refugees until they can get into an affordable apartment. “The families we assist are veteran families in every sense. They fought side-by-side, shoulder-to-shoulder with our troops. They offered life saving support services. They were not just translators but offered logisitics support, and support the U.S. mission against the Taliban and ISIL. They are our allies. But to leave them in Iraq and Afghanistan means certain death,” Smith said. To enter into the U.S. under the Special Immigrant Visa program, the primary applicant must have two years of faithful and honorable service; must be recommended by two U.S. citizens and obtain approval from a Commanding Officer; and must be targeted by the Taliban and ISIL for death. The majority of SIV refugees in the Rochester chapter have 4-6 years of service, but there are several with more time working for the U.S. military. No One Left Behind was founded in Washington, D.C., by Rochester native Matt Zeller, after he fought for 5 years to get his interpreter, Janis Shinwari, into the U.S. Zeller had raised $35,000 to help resettle the family, but Shinwari turned down the money, asking Zeller to help others as Zeller had helped him. Smith became involved when a friend of Matt’s asked for help on Facebook in resettling his two interpreters in Syracuse, and Smith volunteered to help the Army captain.